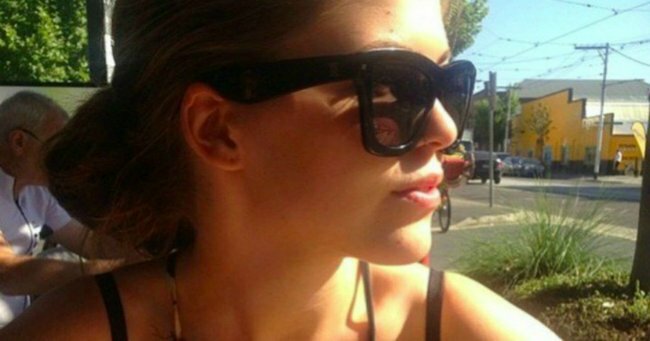 Belle Gibson blows kisses and dodges questions from the media. Belle Gibson, the young Australian woman who built a wellness empire based on a made-up story about surviving brain cancer, called police to her Melbourne home this week after discovering a couple of media waiting outside. 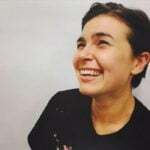 Dressed in all black and sporting newly dyed dark hair, Gibson, 24, was asked if she had anything to say about her infamous actions, the Herald Sun reports. The cancer con artist dodged the question but paused long enough to blow the media a kiss before driving away. Gibson has left her million-dollar three-bedroom home in Elwood to move to more modest surroundings in Northcote. It’s been more than a year since everything went pear shaped for Gibson and the stories she told about curing her cancer through her ‘lifestyle’ turned out to be a hoax. The disgraced blogger is currently embroiled in legal action after the Consumer Affairs Victoria was awarded the right to pursue a civil suit against her in March. The CAV alleges Gibson made false and misleading claims and engaged in unconscionable conduct. The CAV alleges Gibson&apos;s claims about her cancer and her road to recovery were used to market her The Whole Pantry app and cookbook. It is also being alleged the 24-year-old didn&apos;t pass on up to $300,000 of promised donations to charities. Watch the reportage of the CAV case brought against Gibson. Post continues after video. Gibson failed to turn up to court for the second time last Friday and is reportedly yet to file a defence in the case against her. The Age reported that Justice Debra Mortimer has given Gibson until 4pm on July 10 to file before she risks being charged with contempt. “They are serious allegations and I want Ms Gibson to know the consequences of not contributing in this case." Gibson could face prison if found guilty of contempt of court.